Title favourite Serena Williams made a shock exit at the Australian Open as injury derailed her hopes against Sloane Stephens in the quarter-finals. The 15-time Grand Slam champion led her fellow American by a set and a break, but after being treated for a back spasm in the second set went down 3-6 7-5 6-4. Williams was heard on court to say it had been the "worst two weeks" as she has struggled with ankle and back issues, and afterwards she stuck by that assessment. "For a Grand Slam, absolutely. Absolutely," she said. It's not Nadal-Rosol, quite, bearing in mind the injury worries surrounding Williams before the match, but that is still a huge shock. And for all the physical problems the five-time champion was clearly going through, Stephens produced a level of play under intense pressure that suggests Brad Gilbert's claim might be right - she could be a future number one. Now she has to recover quickly to take on Azarenka tomorrow. "I'm almost relieved that it's over because there's only so much I felt I could do. I was unaware the microphones picked that up. "But, it's been a little difficult. I've been thrown a lot of balls these two weeks." Asked about the back problem, Williams played it down, saying: "I think everyone at this stage in the locker room has something wrong with them, so it's fine. There's no excuse there." Stephens, 19, is on the verge of breaking into the world's top 20 and was playing in her first Grand Slam quarter-final. She gave a good account of herself in the opening stages, but Williams looked to have seen off the impressive teenager when she reeled off five straight games from 3-3. However, Williams came into the match carrying an ankle injury picked up in round one, and appeared to turn it once again in the second set. 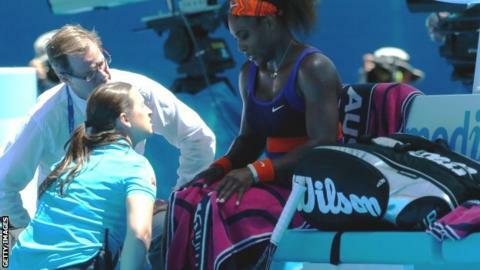 The 31-year-old shrieked in pain while rushing forward for a ball at 4-3 down and the doctor was called at the next changeover, prompting Williams to head off court for treatment. Regularly grimacing in pain between points, the five-time Australian Open champion was unable to serve or move at anything like 100% and Stephens took advantage to level. With the match apparently slipping from her grasp early in the third, a furious Williams smashed her racquet on the ground and flung it towards her chair, picking up a code violation. She battled on, however, determined not to end a run that saw her win Wimbledon, the Olympics and the US Open in succession last year. After resisting the pressure of three break points at 3-3 in the decider, Stephens could not stave off a fourth and slammed a forehand into the net, but Williams handed it back straight away for 4-4. It was the younger player who was the stronger in the closing stages and when facing two match points, a fading Williams could only find the net - to the astonishment of Stephens as much as anyone else on Rod Laver Arena. "I think I was convinced that I was able to do it when I lost serve in the first game in the second set and I went down 2 0," she said. "I was like, this is not the way you want it to happen. But you just fight and get every ball back, run every ball down, and just get a lot of balls in play. "From then on I got aggressive, started coming to the net more, and got a lot more comfortable. I just played my game from there." The new star of women's tennis will take on defending champion and world number one Victoria Azarenka in the semi-finals on Thursday.